All aboard for ThreadABead's 2017 Christmas project! Yes, that's right we are going loco crazy this year with our festive Christmas Train Ornament. At 10 inches long (with all carriages attached) this piece of beadwork is sure to be one of your most prized and stunning Christmas ornaments each year. In part 1 we will be creating the train engine. There will be 5 parts in total and part 1 will be the largest part, knowledge used in part 1 will be required for all subsequent parts. All remaining parts do not need to be purchased in order, and do not even need to be displayed in order. So let's take you on a tour of the 3D Train Engine! 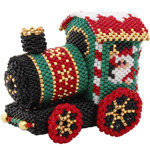 The train is beaded in a Christmassy red, green and gold colour scheme, with decorative elements such as the snow lined roof, candy cane edges, snowflake border around the boiler and even a set of Christmas bells at the back! See Santa hanging out of the driver's cabin, pulling on the train horn to let everyone know the train is nearby. On the other side of the cabin is elf Dinky Diesel, who loves to ride shotgun with Santa. Please note: This is the most advanced project currently available by ThreadABead. Although no knowledge is assumed, it is recommended that the beader does have prior experience of beading. Techniques used are Odd Count Peyote, Even Count Peyote and Round Peyote with increases and decreases. As usual with ThreadABead featured patterns we give full detailed photographic instructions and in this part there are 145 detailed steps. Please note the pattern may not work with any other size and type of beads. There are 11 colours in total and the finished beadwork is approximately 5.25cm (w) x 3.5(d) x 5 (h) cm Wadding is required and a no tangle thread bobbin is very useful. The use of a black felt tip pen is optional. The bead pattern supplied is 46 pages with full colour step by step photographic instructions a coloured pattern chart where needed.